Nicole Schramm-Sapyta of the Duke Institute for Brain Sciences researches addiction. In the summer of 2016, she began working with a Duke Bass Connections Brain & Society team to learn more about the opiate epidemic in Durham. In Bass Connections teams, students and faculty address real-world problems through research, creativity, and collaboration with external partners. Interested in the local law-enforcement perspective on drug use, they met with members of the Durham Police Department’s Crisis Intervention Team (CIT). CIT members are police officers and other first responders who have received extensive special training to respond to citizens in crisis, often due to underlying behavioral health issues such as addiction or mental illness. More than 950 first responders in Durham have been CIT-trained since 2007. When Schramm-Sapyta and her students first met with the CIT officers, a one-hour meeting stretched to more than two hours of open, honest discussion. The students asked hard questions and the officers responded with experience, policy information, and honesty. The Bass Connections students were so impressed that they wanted to spread the word. They organized two CIT presentations on campus and three Mental Health First Aid training sessions, the latter completed by more than 100 members of the Duke community. Data+, run by Duke’s Rhodes Information Initiative, is a 10-week summer research experience for undergraduates interested in exploring new data-driven approaches to complex challenges. The annual event recognizes “Exemplary and Dedicated Work of Durham County’s CIT First Responders,” according to the program. Sponsors included National Alliance on Mental Illness (NAMI) Durham and Alliance Behavioral Healthcare. Teshéa Grant, Public Information Officer for Durham County Emergency Medical Services (EMS), served as Mistress of Ceremonies. 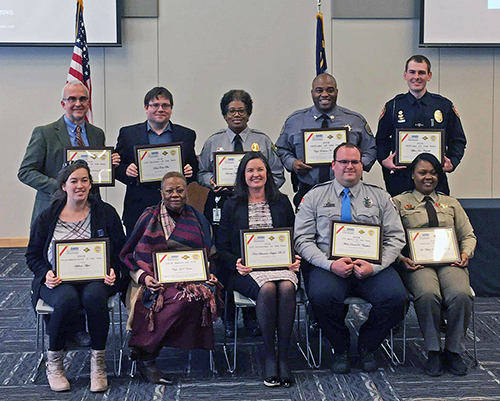 Team members from EMS, the Sheriff’s Department, DPD, Duke University and N.C. Central University Police departments, Durham Emergency Communications, and Durham Technical Community College also were honored. Local officials attending included City of Durham Mayor Steve Schewel, Durham County Board of Commissioners Chair Wendy Jacobs, and current and former Durham County Sheriffs Clarence Birkhead and Mike Andrews. Len White, Associate Professor of Neurology and DIBS Associate Director for Education, attended as co-leader of the Bass Connections Brain & Society theme, which DIBS manages. The Data+ team’s first project was to analyze 9-1-1 calls between 2011 and 2016 and determine if there were any patterns related to CIT-tagged calls—and indeed there were! Behavioral health-related calls typically peak on Wednesdays between 8 a.m. and noon, (“Hump Day is real,” said Schramm-Sapyta), but are sparse on Sunday mornings between 4 and 8 a.m.—information CIT could then use to deploy resources. In 2017, a second Data+ project looked at whether CIT was helping reduce recidivism, i.e., how often convicted criminals are returning to jail after they have been released. Those identified as having a behavioral health issue are much more likely to return to jail, Schramm-Sapyta noted. This time, data were provided by the Durham County Sheriff’s Office and the Durham County Jail. “Before CIT existed, recidivism was on the rise in Durham,” Schramm-Sapyta said. 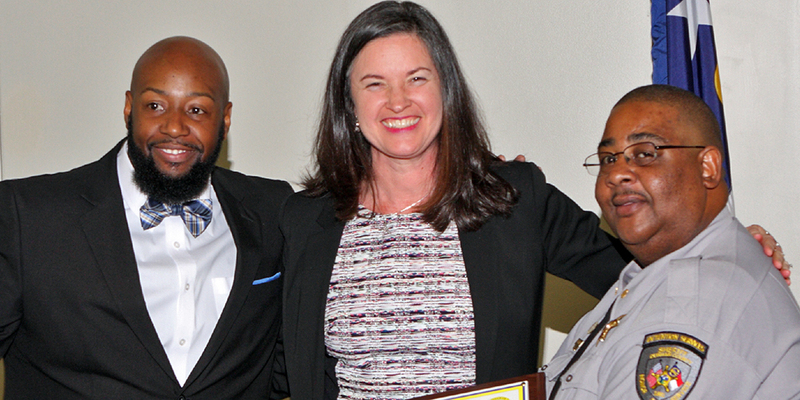 “As CIT was first established, and the program began to grow, recidivism leveled off.” In the most recent five years, as CIT and Durham have grown rapidly, and other mental health services at the jail and in the community have increased, recidivism has dropped sharply, she noted. Ed Balleisen, Duke’s Vice Provost for Interdisciplinary Studies, oversees DIBS and Bass Connections. He emphasized the special nature of the Data+ and Bass Connections projects linked to the Durham community. “This is a fantastic example of the potential for really deep, enduring partnerships between Duke and local institutions and law enforcement in the city and county of Durham,” he said. “These projects allow pursuit of significant research questions that can inform decision-making and deploy the creativity of Duke’s faculty and students in partnership with local institutions to carry out that research and present it, with an eye toward allowing decision-makers to see their world more clearly and have a better sense of what’s working and what isn’t,” Balleisen added.